Who’s Really Standing Up for Artists? Tensions running high at the Villa Carlotta on Sunday night. In case you haven’t been following recent events at the Villa Carlotta, I’ll give it to you real quick. It’s a piece of Hollywood history, built in the 20s, and home for many years to musicians, artists, writers and other creative folk. But it was rent-controlled, and not too long ago the owner decided he wasn’t making enough money off it, so he sold the property to a developer who planned to turn it into an extended-stay hotel. As part of the process, it was deemed necessary to get rid of the existing tenants. Many of them were forced out using the Ellis Act. Windows boarded up at the Villa Carlotta. Of the 50 apartments in the Carlotta, four are still occupied. Some of the tenants decided to fight the evictions, and not just because they wanted to hang on to their homes. There are a number of reasons to object to what the developer is doing here. First, the Carlotta is a historic building, and as such it’s protected by state law. In order to turn it into a hotel, the current owner planned extensive alterations to the structure. 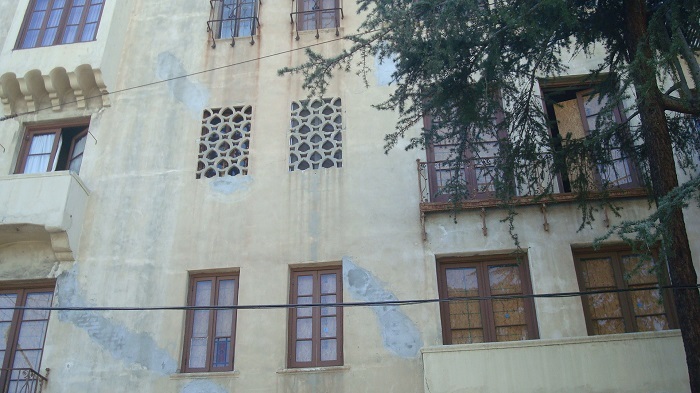 The remaining tenants, worried that the modifications would do irreparable damage, took their case to the Cultural Heritage Commission, which sided with them. 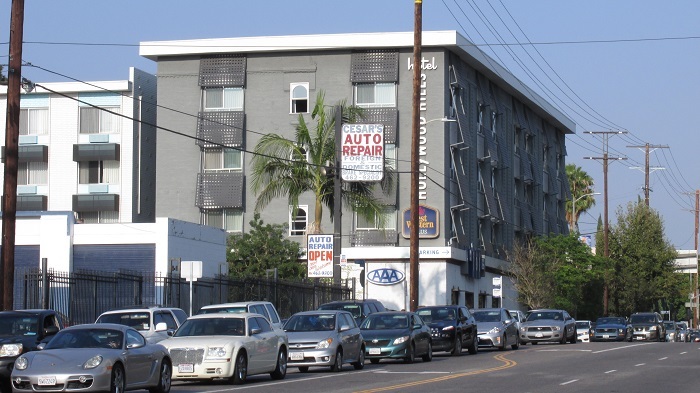 Second, Ellis Act evictions have caused the loss of thousands of rent-controlled units in LA. A recent study by UCLA found that this city is the least affordable major city in the nation, and mass evictions are only making things worse. And third, up until this whole mess started, the Carlotta was home to a community of creative people. 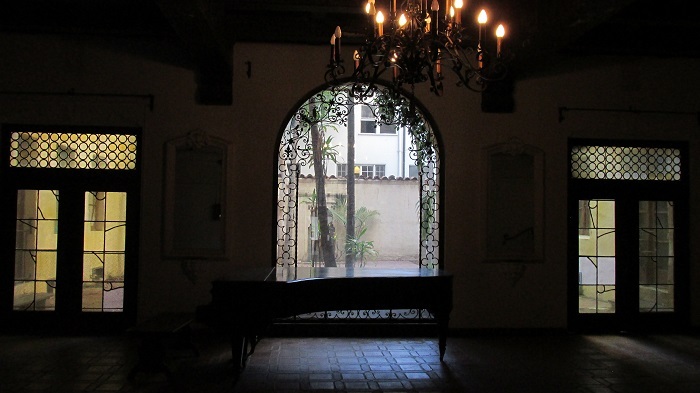 According to many of the former tenants, it was a place where budding screenwriters and struggling artists could meet friends and make connections, where they could share their work and shape their ideas. The lobby where tenants used to gather, now deserted. This aspect of the story took on new importance when it was announced that the Hollywood Arts Council had decided to hold a fundraiser at the Carlotta. The HAC apparently thought it would be the ideal place for the event, which was held to raise money for arts education at nearby Cheremoya Elementary School. The remaining tenants at the Carlotta were surprised by the announcement. It seemed odd that an organization which has the stated goal of supporting the arts in Hollywood had decided to hold their event at a venue that was nearly vacant because dozens of artists had been forced to leave. They contacted the HAC and explained the situation, asking if the organization would consider moving the event. The answer was polite, but firm, no. Bothered by the apparent hypocrisy of the HAC’s actions, the tenants decided to protest. Sylvie Shain, one of the few remaining inhabitants, had imagined the protest as an elaborate performance piece. 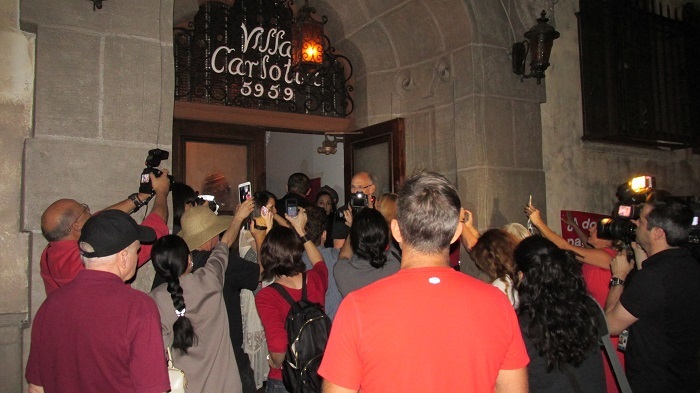 Former tenants were asked to come to the event wearing white, and they would stand for the ghosts of the Villa Carlotta. Alternately, attendees could show up dressed in red to symbolize of the affordable housing massacre that’s taking place. 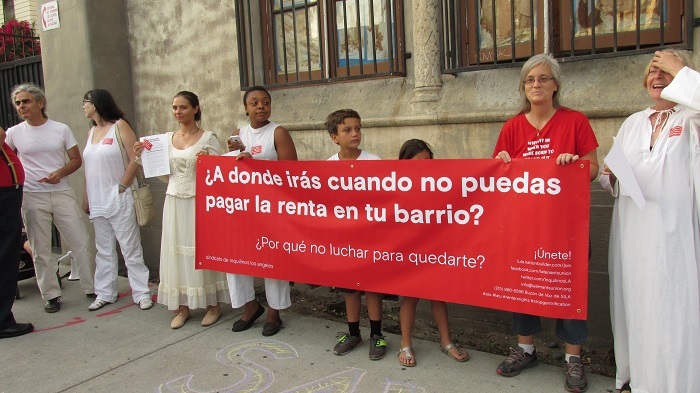 The idea was to dramatize the plight of renters throughout the City. Protesters holding a banner to protest evictions. The same message in English. Unfortunately, things didn’t work out as planned. The first part of the protest, with people congregating on the sidewalk outside, went smoothly. But when Sylvie led a group into the building things got kind of chaotic. There were moments when I couldn’t figure out what was going on. But one thing is clear. At one point Sylvie was forcibly ejected from the building and temporarily denied re-entry. On the positive side, the event got a fair amount of media coverage. Two local stations showed footage on the evening news, and Curbed did a piece as well. 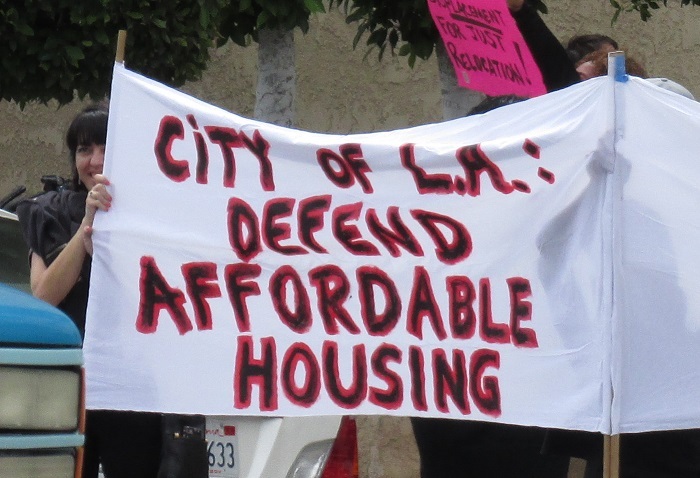 The Los Angeles Tenants Union joined the residents of the Carlotta, and LATU members spoke eloquently about the affordable housing crisis in LA, emphatically pointing out the damage that the Ellis Act is doing. It’s important to say that artists aren’t just having a hard time finding housing in Hollywood. 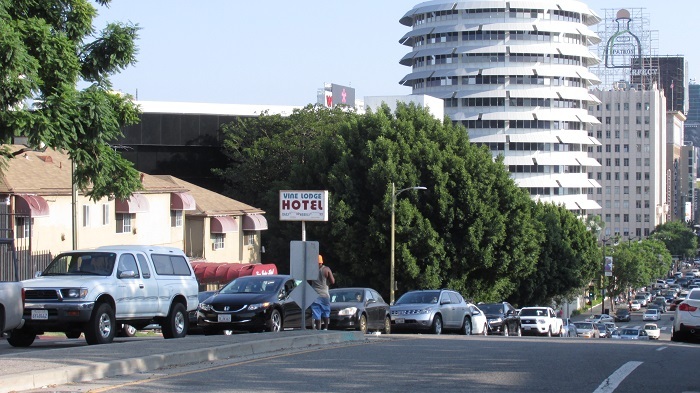 In recent years Silverlake and Echo Park have both seen an exodus of musicians, writers and others who can’t afford to pay what landlords are asking these days. And then there’s the sick joke of the Arts District in Downtown. In the late 70s, creative people started moving to the industrial districts in the City’s center. The community came together because people who were struggling to make music or art or whatever could find cheap rents in areas that nobody else wanted to live in. But then the developers discovered it, started marketing it as the Arts District, and housing prices soared. Many of the artists who had created the community were forced to leave because it got too damn expensive. So let’s get back to the question I asked in the heading for this post. This past Sunday night, who was really standing up for artists? Was it the Hollywood Arts Council, knowingly holding their fundraiser at a site where dozens of creative people had been forced to leave? Or was it the scrappy band of tenants who staged an action to call attention to the fact that artists and others are being thrown out of their homes all over LA? You can probably guess what my answer would be. Sylvie put together a beautiful brochure for the event, which you can view by clicking on the link below. And if you’d like more info about the situation at this historic building, here’s a link to the Save Villa Carlotta Facebook page. 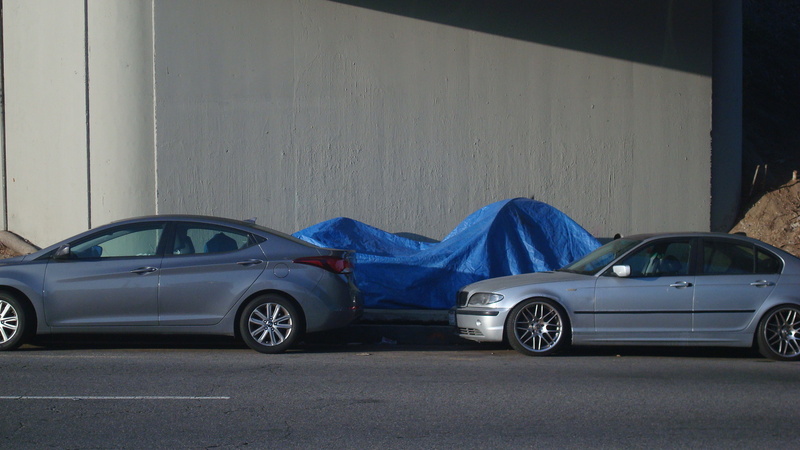 The Mayor and the City Council recently declared that LA is in the throes of a homeless emergency. While I’m glad that our elected officials have finally decided to acknowledge how serious the problem is, they still haven’t offered any concrete plan of action. The promise of a hundred million dollars in funding is worthless until we know where that money’s coming from and how it’s going to be spent. But I’d like to offer a suggestion on how to combat homelessness, and the people at City Hall should be glad to hear that they won’t have to spend a penny to implement it. My proposal is simple. I can give it to you in two sentences. Stop the destruction of affordable housing. Now, you may be saying, that’s ridiculous. The City doesn’t have the authority to do either one of those things. The Ellis Act, a state law, gives landlords the right to evict tenants if they decide they don’t want to be landlords any more. And the City can’t prevent a property owner from demolishing rental units if the owner does so within the boundaries of the law. But the City can stop giving landlords incentives to do these things. As the housing market heats up again, the potential to reap huge profits has drawn a slew of developers to LA. Speculators swoop into neighborhoods offering wads of cash to landlords, but they don’t just want to buy existing buildings. They’re interested in maximizing their profits, which often means kicking tenants out of rent-controlled apartments and either converting the units to condos or knocking the building down and putting up something larger. And here’s where the City comes in. 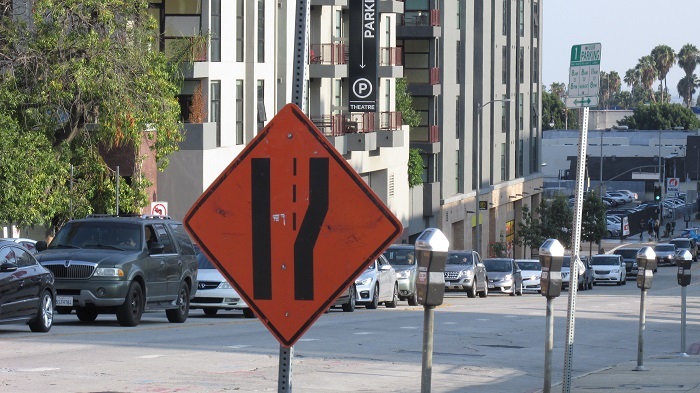 For developers to accomplish their goals, they often need to get the City to grant variances. They might ask the Department of City Planning to reduce the required setbacks from the sidewalk or neighboring buildings. Or maybe to relax the height limit. In some cases they ask the DCP to change the way an area is zoned, which could allow them to turn an apartment building into a boutique hotel. All of these entitlements granted by the City increase the value of the property because they increase the potential for profit. The more money there is to made, the greater the attraction for investors. The more money investors offer, the greater the temptation for landlords to evict their tenants and sell the building. During the last housing bubble, this trend peaked in 2005 when over 5,000 rental units were taken off the market. When the recession hit, property values plunged and evictions dropped. But as the market heats up again, we’re seeing this practice becoming popular once more. In 2013, landlords took 308 units off the market. That figure more than doubled in 2014, rising to 725. And as long as housing prices continue to rise, you can bet that evictions will rise as well. For more details, take a look at this article from the KPCC web site. While there’s usually some negotiation involved when developers seek variances from the Department of City Planning, they usually get most of what they want. And as long as the DCP continues to hand out entitlements like candy, developers will feel confident that they can make tons of money by converting existing buildings to condos, small-lot subdivisions or boutique hotels. This means more people will be evicted, and more affordable housing will be taken off the market. I’m not claiming that everybody who gets evicted ends up living on the street, but a significant number do. While I couldn’t fine any data on evictions leading to homelessness in Los Angeles, in New York the data shows that it’s a leading cause. Check out this article from CityLimits. So if the City of LA is really serious aout tackling homelessness, our elected officials need to stop making it so attractive for landlords to evict their tenants. The Department of City Planning needs to start asking if the needs of wealthy developers outweigh the needs of renters on a limited income. 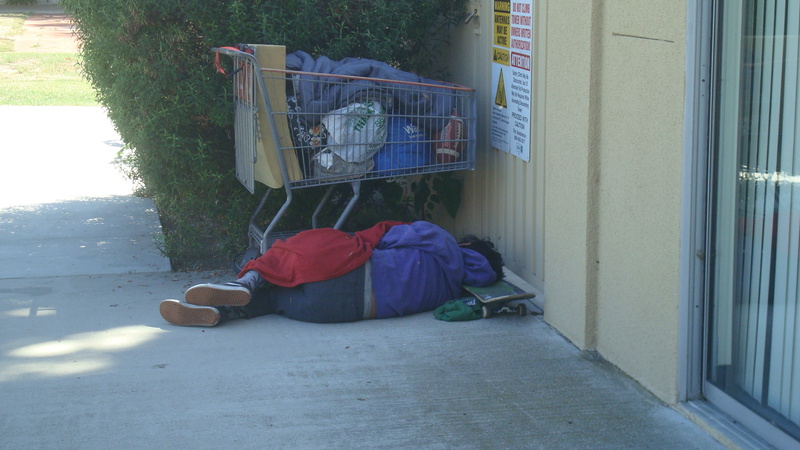 Yes, we are dealing with a homeless emergency. The people at City Hall must start looking at the policies that have contributed to this situation, and think about the changes that need to be made. Building shelters for people living on the streets is fine. But an even better approach would be to prevent people from losing their homes to begin with. As long as City Hall continues to put the needs of developers over the needs of its citizens, the homeless situation will only get worse. 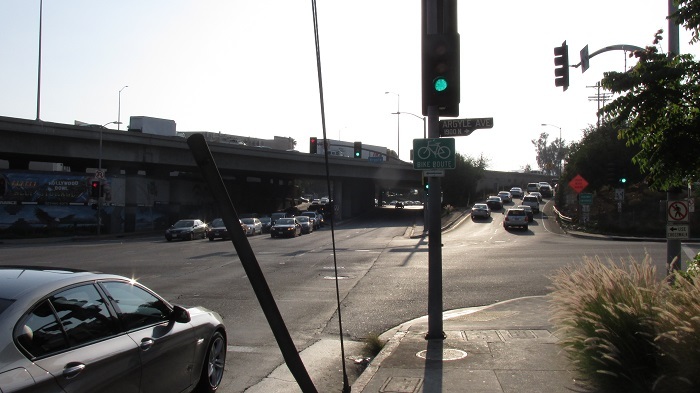 As a follow-up to my last post, I wanted to share this article from LA StreetsBlog. It’s a summary of a panel discussion, Rescuing the California Dream: Policies for an Affordable Future, sponsored by KPCC and the Milken Institute. The participants talked about the challenges posed by LA’s affordable housing crisis, and offered some possible solutions. Nobody was saying there’s an easy way out, but there are things we can be doing to address the situation. Two things I got from the article were that we need to do a better job of planning, and we need to create local funding sources to support affordable housing. But the panel offered lots of ideas, and the consensus seems to be that we can change things for the better. A New Vision or Another Con? A while ago I was walking down Franklin around rush hour, and I came across a sight that’s becoming way too familiar. Looking down Vine, I saw a line of cars that extended all the way down the block. 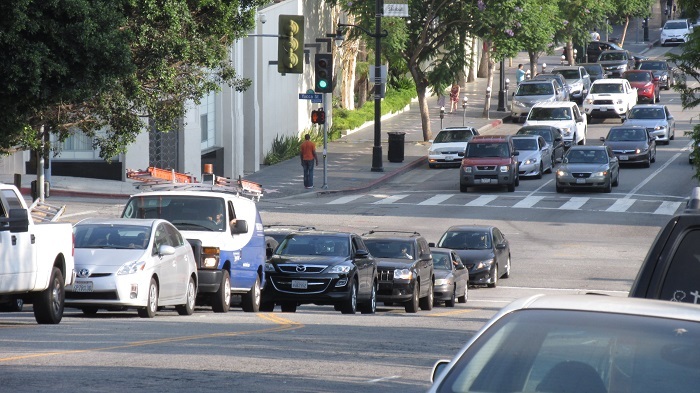 I pulled out my camera, because I’ve kind of gotten obsessed with documenting traffic in LA. You probably think this is a pretty weird pasttime, but it keeps me off the streets. Oh, wait. No, actually it doesn’t…. Anyway, I walked down Vine taking pictures, and guess what I saw when I got to Yucca? If you guessed another long line of cars, you were right. If you don’t live in the area, this may not seem like anything remarkable. But having lived in Hollywood for a while, I can tell you that this is a pretty recent phenomenon. Yucca used to be very quiet. I’d say up to three or four years ago Yucca was empty even at rush hour. Obviously that’s changed. I kept on walking, and you’ve probably already guessed that when I got to Argyle, I saw yet another line of cars crawling along. But the thing that surprised me was, traffic on Argyle was backed up all the way to Hollywood Blvd.. I walked up Argyle, shooting more photos as I passed underneath the bridge. Then I was back at Franklin, and by now everybody knows what I found when I got there. You may be asking, where were all these cars heading? 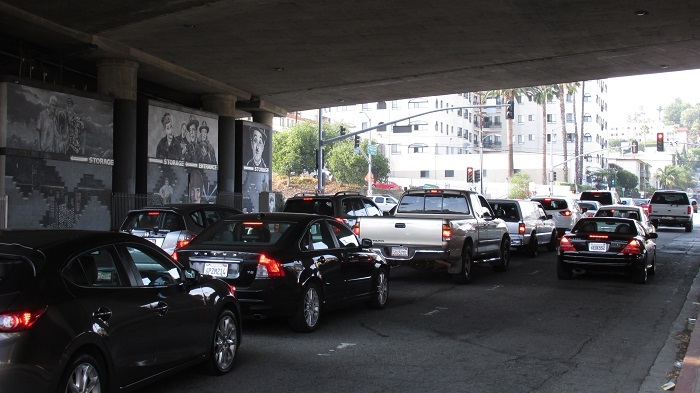 Well, they were all trying to get on the northbound Hollywood Freeway. And traffic on the freeway was moving pretty damn slow. 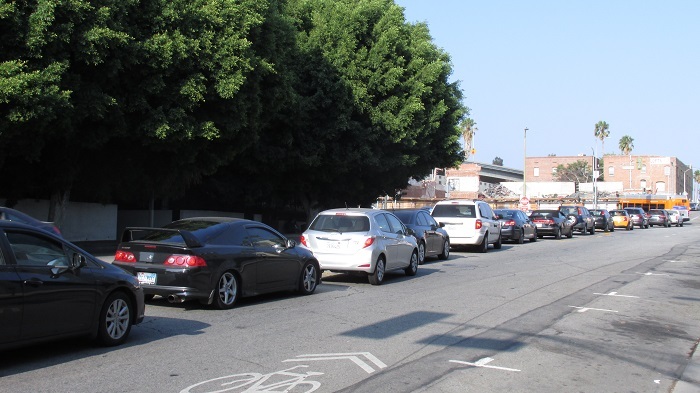 I think we’d all agree that LA’s streets are way too congested, and we’ve got to start thinking about transportation in new ways. Cars are a dead end. We’ve got to stop building to accomodate them. The recent expansion of the San Diego Freeway showed what a waste of time that is. We can add as many lanes as we want, and they’ll all end up choked with traffic. So some people see the City Council’s adoption of the Mobility Plan 2035 as a major step in the right direction. It sure sounds swell. 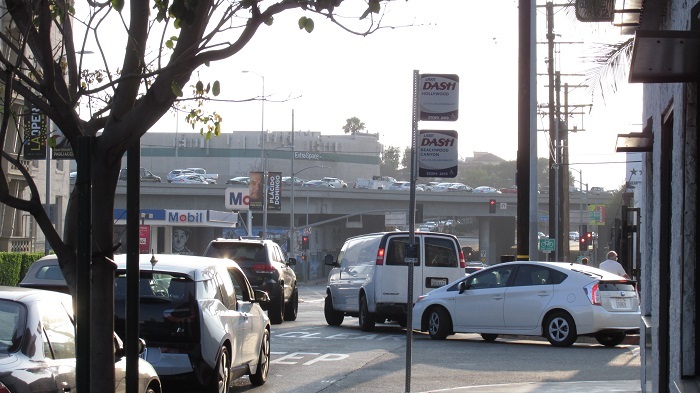 With chapters titled “Safety First”, “World Class Infrastructure” and “Access for All Angelenos”, the MP 2035 paints a picture of a utopian LA, where everybody can get everywhere they want without ever needing a car. But a lot of people are skeptical about the benefits the plan will actually provide, and I’m one of them. I totally support increased access to all modes of transportation, and if you take the MP 2035 at face value, it sounds great. The question is, will the plan deliver what it promises, and to answer that question you have to look at what our elected officials have actually been doing for the last several years. Under the heading Key Policy Initiatives, the plan includes the following goal…. No doubt about it, land use and transportation have to be considered together. For years now the Mayor and the City Council have been pushing transit oriented density (TOD). In theory, planning for higher density near transit centers will create a new dynamic where people will find using public transit preferable to driving a car. Now, if we were building affordable housing near transit centers that allowed easy access to the areas where jobs were concentrated, this might actually work. But that’s not what the Mayor and the City Council have actually been doing. Instead, they’ve been pushing relentlessly for high-end, high-rise housing that caters to people with six figure incomes. Check out the proposed 8150 Sunset, Horizon Hollywood and Shenzhen Hazens project in South Park for three examples. There are many more in the planning stages. Do the rich ride the subway? I’m sure some of them do, but let’s be honest. In LA, this is the demographic that is least likely to use public transit, while people at the lower end of the economic spectrum often have no other choice. This is not transit oriented density. It’s profit oriented density. The Mayor and the City Council can tell us they’re linking land use to transportation to make transit more accessible, but recent history shows that this is mostly a con used to push through projects that only benefit developers who are looking to make a pile of money. Not only have our elected officials’ efforts to create affordable housing been pathetic, but by pushing gentrification in areas that used to be affordable, they’re actually forcing low-income workers farther away from job centers. So if you ask me whether the MP 2035 will deliver what it promises, I can’t say I’m optimistic. 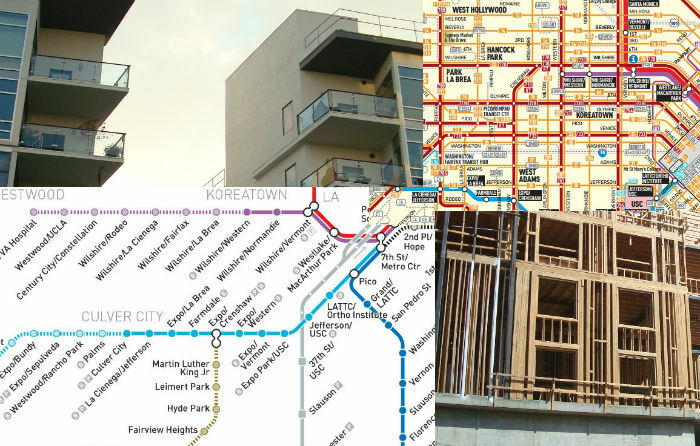 Even before Garcetti became the Mayor, when his council district covered much of central Hollywood, he pushed through a number of “TOD” projects, telling residents that this would solve our transportation problems. Take a look at the video below and let me know if you think it’s working. 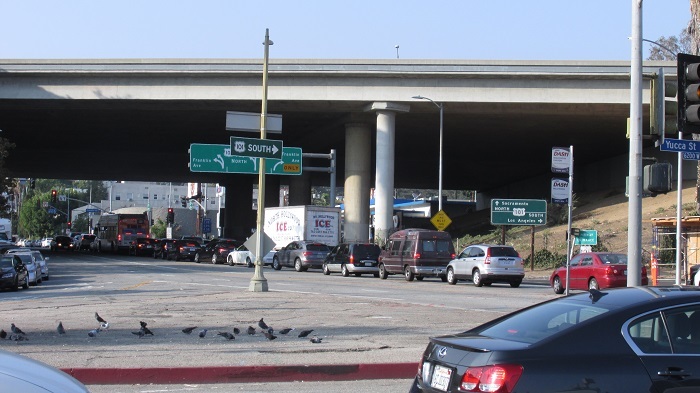 Once again our elected officials have shown us how little they really care about improving the quality of life in LA. On Tuesday the City Council passed two ordinances to make it easier to get rid of homeless encampments. Gil Cedillo cast the only dissenting vote. All the others fell right in line. I totally understand that there are serious health and safety issues with the homeless camps that have been springing up all over LA. I know we have to deal with this. But as usual, the City Council has chosen to attack the symptoms rather than try to address the cause. The reason people are living in tents is because we have an appalling shortage of affordable housing. The Mayor and the City Council continue to back to developers that want to build pricy condos and high-end apartments, but they seem to have no interest in providing homes for anyone besides the rich. Their meager efforts to build affordable housing are pathetic. LA real estate is being sucked up by developers with deep pockets who only care about maximizing their profits. In the past few years they’ve created thousands of new units that go from $2,000 a month on up into the stratosphere. And these same developers have taken thousands of rent-controlled units off the market as they demolish or refurbish older buildings. According to the LA Times, the City’s homeless population currently stands at 26,000, a 12% increase over the past two years. This problem is not going away. It’s getting worse. Councilmember Cedillo makes the point that the vast majority of the funds the City spends on homelessness go toward law enforcement. This is crazy. The police can’t solve this problem. Now you may be asking, can anyone solve this problem? The answer is yes. 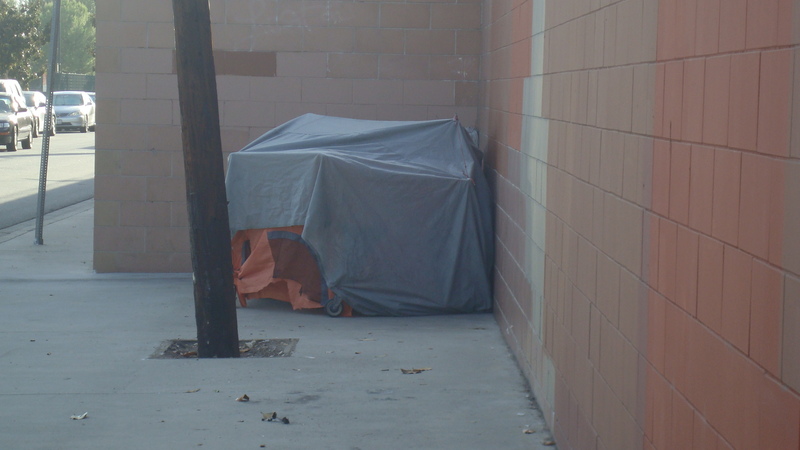 Follow the link below to an article from the LA Times about how Utah is dealing with chronic homelessness. They’ve made huge progress, and the state is actually saving money by providing housing for people who’ve been living on the streets. Of course, LA is not Utah. And I don’t mean to imply that there is a simple solution. But we could do a hell of a lot more than we’re doing now. And we need to start by making a serious effort to provide affordable housing. For more info on the ordinances passed by the City Council, here’s a link to the story in the Times. This Is a Public Servant? If you haven’t heard this story already, I’d like to draw your attention to a piece that ran this week on CityWatch. 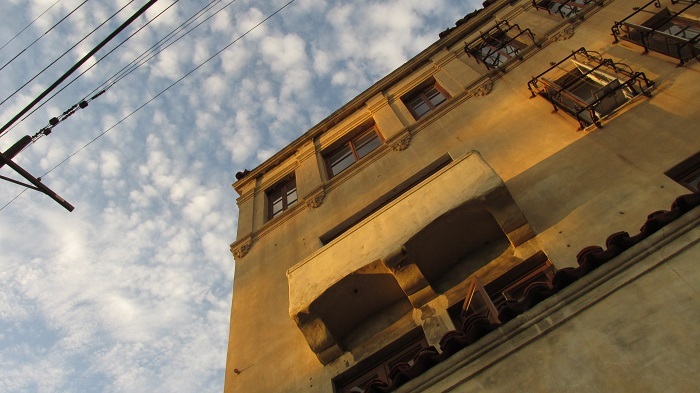 According to the article, 17 tenants are being evicted from four rent-controlled buildings in Beverly Grove and the Fairfax district. Now, you might be saying, why is this news? 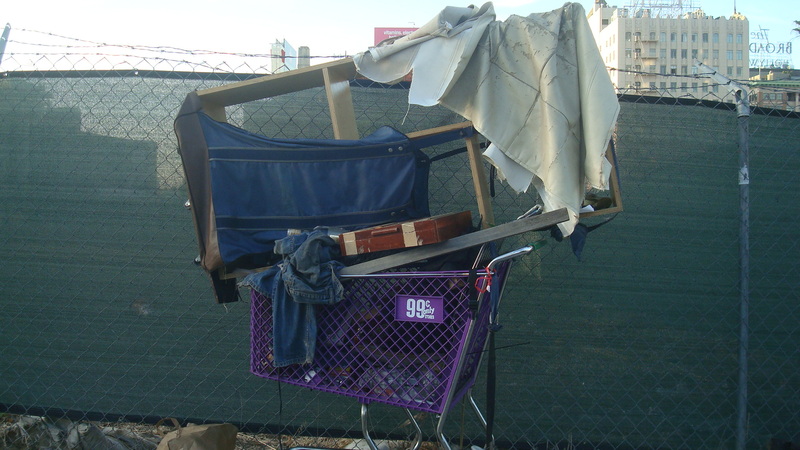 Evictions like this are a common occurrence in LA these days. All over the city developers are kicking people out of their homes so they can build high-end residential units. Why is this story special? Is this sick or what? Does this guy understand the mission of the agency he’s chairing? Doesn’t sound like it to me. That’s why I sent an e-mail to Jerry Brown asking that he be removed from the CalHFA board. If you’d like to contact the governor as well, here’s the link. And here’s the link to the story on CityWatch.